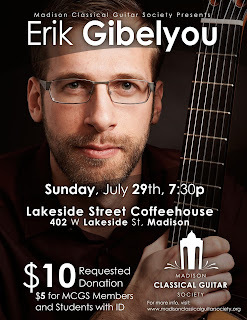 MCGS is excited to welcome Erik Gibelyou back to Lakeside for another special night of music. 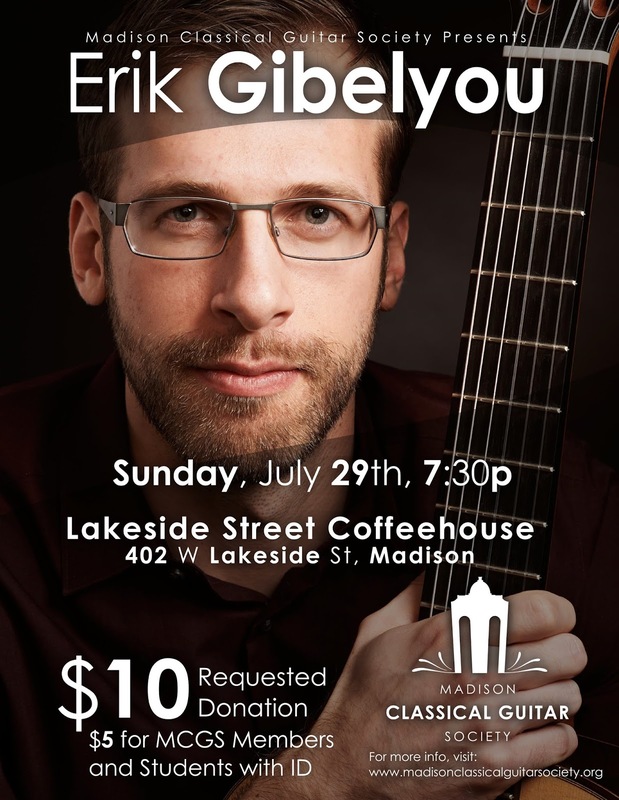 Mr. Gibelyou is an active performer, giving solo classical guitar recitals as well as performing with other musicians. He connects intimately with his audience through an expressive and sensitive touch on the guitar. Erik has performed and presented at the Michigan Classical Guitar Workshop and has participated in the Rome Festival's Chamber Music Seminar in Italy. He has participated in several national and international guitar competitions. In Rochester, NY, he performs regularly at the Classical Guitar Night in the Little Theatre Café. Erik enjoys performing a wide variety of music, and his repertoire spans from the Renaissance to the modern day. A committed teacher, Erik keeps busy teaching guitar, group classes, and chamber groups at the Kanack School of Musical Artistry while also maintaining a private studio. As a teaching assistant at the Eastman School of Music and the University of Wisconsin–Madison, Erik has taught music theory, the history and literature of the guitar, and intro to classical guitar. As Director of Outreach for OSSIA New Music, a student-run organization at Eastman, he aims to make contemporary music more accessible to the public and bring new music to new places in the Rochester area. A native of Bay City, Michigan, Erik is currently pursuing the Doctor of Musical Arts in Performance and Literature at the Eastman School of Music in Rochester, New York, where he studies with Nicholas Goluses. He studied with Javier Calderón as he earned his Master of Music in Guitar Performance at the University of Wisconsin–Madison, where he also earned his Master of Arts in Music Theory. Erik studied with Brad DeRoche as an undergraduate at Saginaw Valley State University where he earned his Bachelor of Arts in Music.